‘Wrong-beliefs’ are infinite, whereas ‘right-belief’ is singular. 1) Jai Sachchidanad Sangh by agna and grace of PPS Kanudadaji announces the First ever Sibir at Kelanpuri Tirth Kshetra for HINDI BHASHI Mahatmas/mumukshu’s ( Hindi speakers) from 24th March to 28th March. 2) After two successful youth conference by Research Center(VVCRF) 3rd YOUTH CONFERENCE is organised at Mahavideh Tirthdham on 4th May ( afternoon) to 5th May (evening). 3) Yearly Youth Shibir for all unmarried youth boys, which was started in 1993, is to be held this year at "Sanatan Sanskar Kendra,Himmatnagar" from 28th May to 2nd June. 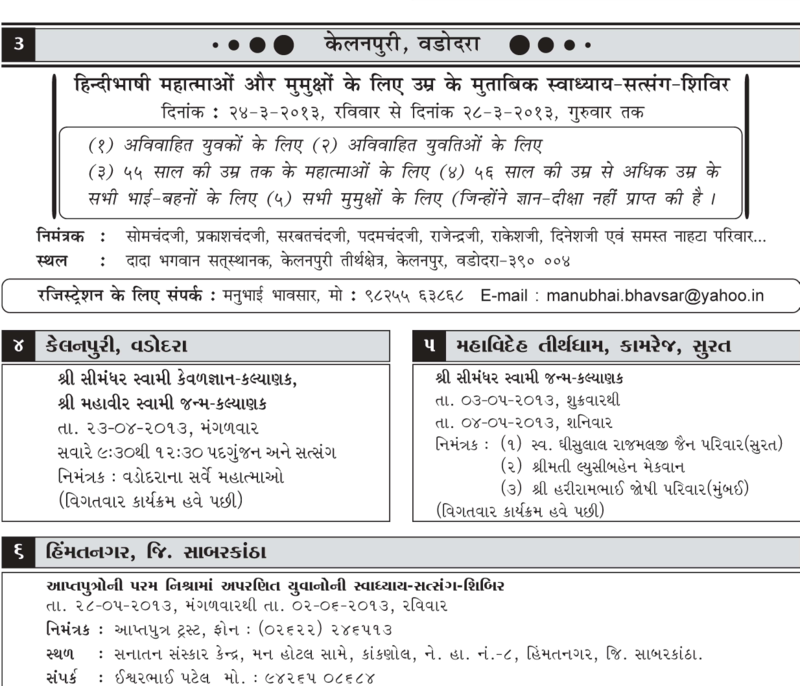 India: Feb 20 [IST]: 09.00 am to 10.00 am in Baroda, at Sudhan Apt. Please find attached the programme of ‘Gnan Gabdhi Parv’ on 23th & 24th February At Sarvamangal Sanshtan, Lapkaman, Ahmedabad. As we all know that PPS Kanudadaji was graced by "Dada Bhagwan" in February,1963. So Golden Jubilee Year of ‘Gnan Labdhi Parv’ celebration was started in February- 2012 and now it’s a completion; 50 Golden Years, The Golden Jubilee. Let us celebrate the Ajanmajanm of we all together as the Gnan Labdhi Parv and move towards Completion. Very attack of any sort of ‘opinion’ within the dual nature is the initiation of Karma by way of seedling. To see the formless within the aspectual forms of a Live Liberated State is called ‘Nididhyasan’, and when you see that, that seeing function is again formless because it is divine-vision wise.